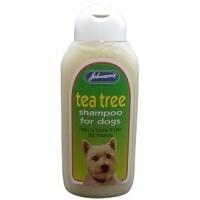 Johnson's Tea Tree Shampoo for Dogs is a gentle shampoo, kind to your pet's skin. The mild formula gently cleanses the skin and soothes irritation. The antiseptic properties of this shampoo promote the natural healing process whilst the added Aloe Vera nourishes and protects the skins as well as washing away odours. With all the benefits of a great wash, this shampoo also protects your pet and minimises the discomfort of skin irritation. Nice gentle shampoo for sensitive skin - and it smells nice!